Angel-Eco submitted the following “walk” for the “World’s Top Ten list of Walks” for Walking Magazine – it actually made the top ten. 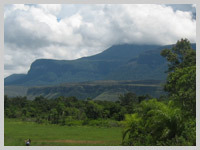 Uruyén and Kavak are two Pemón lodges in the Gran Sabana region of Canaima National Park, Venezuela. The trip can be broken up in two if necessary and started from either Uruyén or Kavak. Upon reaching either destination, lunch is served and the hikers have the option of continuing their hike to breathtaking waterfalls in Yurwan Canyon or the sacred Kavak Cave. 1) What makes this walk unique? To get to Uruyén one flies over the world’s highest waterfall, Angel Falls and some of the parks 160 tabletop (tepuys) mountains before landing on the same grass strip that Jimmie Angel did not so many years ago (1937) before he went on to discover Angel Falls. The scenery is breathtaking. It is also the site were Ruth Robertson landed in 1949 and set up camp before her epic journey to Angel Falls by river / foot in 1949. She and her team were the first to make this journey to the base of Angel Falls when four other teams failed – some never returning. 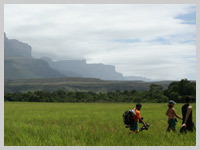 Canaima National Park is unique, combining Sabana (grasslands) with canopied jungle and huge tabletop mountains (tepuys). These mountains are believed to be the oldest rock formations on this planet and it is said that the most UFO sightings in the world have been recorded in this region. 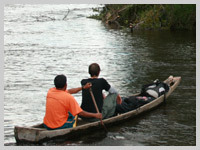 Coupled with the scenery is the wonderful insight into the culture of the indigenous peoples of the region – the Pemón. 2) Please share some details of the scenery of the walk(s). What sights, sounds, scents and feelings does this walk(s) evoke? Sights – scenery unlikely rivaled anywhere. 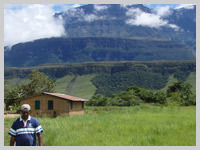 Grasslands, rainforest, jungles, Pemón villages and farms, all overlooked by huge, awe inspiring tabletop mountains. Throw in a couple of river crossings by dugout canoe (curiaras) and man-made bridges, the hikes in the ancient canyons of Uruyén and Kavak that end with spectacular waterfalls and pools below them just ripe for a refreshing swim. On the hike from Uruyén to Kavak (or vice versa) we will pass by the famous rock where it is said that an ancient shaman “Kaikárua (Piasán)” performed a spell to “lock together” for eternity his cheating wife and lover. It is worth mentioning that at night one can experience pristine star studded skies overhead and lightning over the tabletops in the distance – especially during rainy season. The fireflies too are out in force seemingly glowing in sync with the far off lightning over the tepuis. 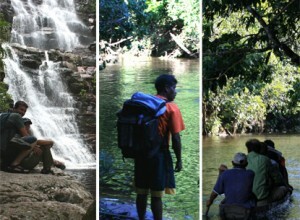 The hike to the waterfalls of Kavak or Yurwan combines hiking, wading and swimming (short distances) into the canyons that tower high above you on either side. Finally, one is confronted by the sight of the falls in the distance – a sight that cannot be described in words. Before entering the sacred cave of Kavak visitors must make the customary chant to the “Indian” spirits to allow them to enter. Sounds – the cicadas and crickets are constant, with the occasional birds overhead like the green parrots, toucans, humming birds and Caracara. Scents – the air is very clean, the grasslands and jungles have a very distinct smell to them really not unpleasant at all. Feelings – this is a very spiritual area and if anyone with an open mind can really feel the energy. Besides which solitude and gratitude spring to mind – it is a humbling experience invoking happiness to be alive and present to experience this place. At the same time one can’t help but be in total awe of the landscape, which is always changing around you. 3) Describe the terrain and the approximate length of the walk(s) and the time it takes to walk it. How much physical ability does one need to complete it? Uruyén to Kavak – around 5 miles in length, time-wise two to three hours at a leisurely pace. This section of the hike is very moderate and the paths are all very well marked on an even terrain. Kavak / Kavak Cave / Kavak – around 1 1/2 miles with slightly steeper terrain, again on well marked paths alongside Kavak River. Part of the hike takes some quite steep paths through canopied rainforest before ending up alongside the river in a small canyon. Here the hikers rest a while before wading / swimming the last leg to the incredible Kavak cave with its towering waterfall and pool. Uruyén / Yurwan Cave / Uruyén – similar to Kavak above but seldom visited by tourists, around a mile and a half with reasonably well marked paths along Yurwan River. As for Kavak canyon the hike incorporates climbing through some canopied rainforest and crossing the river a number of times before reaching the final destination another towering waterfall and pool. Well worth the visit and effort! For the latter expeditions one needs to be reasonably fit, however, the first part of the days hike is far from strenuous. 4) Describe the practicalities of the walk(s): Is it well marked? Is it accessible to lodging and food? Is there a time of the year that is best? Is there any special gear/clothing a visitor needs? Any precautions (bears, ticks, etc.)? The paths are well marked but they are guided with a multi lingual guide and one or two Pemón guides always present. Spanish is a common denominator with the guides and Pemón. Accommodations are provided in the lodges of Uruyén and Kavak. It is advisable to carry water and maybe something to snack on along the way since not everyone will sample the manioca bread etc. available on the walk at some of the Indian communities visited. The walks are planned all year round since the climate is pretty constant in this region. Regarding precautions, sunscreen lotion is recommended and a mosquito repellant for the legs if wearing shorts. The mosquitos are not plentiful or dangerous, but for extra comfort repellant is advised. Suggested clothing: baseball cap or something to cover the head, shorts, tee shirts, hiking boots, poncho (in case of rain) and of course swimming costumes. 5) Please share with us anything else that makes the walk(s) special. Apart from the incredible scenery we visit a couple of Pemón communities seeing for ourselves how they farm and live in harmony with their surroundings. The Uruyén and Kavak lodges are run by the Pemón who are very gracious hosts. Maybe they will play local music and perform ceremonial dances for us if we are lucky. The dances are somewhat spontaneous but they like to do this to show off their culture, which is unfortunately dying – the elders are the “keepers” of the myths and legends; they really have no written language that is passed on. Angel-Eco Tours and Angel Conservation are working directly with the Pemón communities of Kamarata Valley to help sustain and bring alive their culture through responsible tourism and projects that enable the Pemón to restore their dignity and history once again.